A reliable and powerful power bank is an essential piece of technology for anyone who constantly uses their phone or other mobile device while on the go. As the mobile device industry expands, so does the availability of all kinds of different power banks. Our team has compiled a list of the best power banks so you don’t have to spend any more time than you must to find the right unit to fit your needs. Each of our reviews highlights key features for each device we reviewed to help guide your design. Also, don’t forget to check out our power bank buying guide, so you can get a better idea of what kind of power bank you should buy and what kind of prices you should expect. Read more about our methodology. If you want performance, power and speed, look no further than the Anker PowerCore Speed 10000 QC. This power bank is built to charge your devices quickly and safely, without needing to constantly recharge the power bank itself. This unit also features a unique cooling system so it doesn't overheat while charging your devices. The Lumina 10,000 mAh Ultra Compact power bank is small and packs a punch. It's also built from durable materials so you don't have to worry about the inevitable bumps and scuffs it's sure to experience while you're using it. This power bank is also capable of charging your devices faster than conventional chargers, making this a hard act to follow. This power bank is affordable and powerful, all wrapped up in a sleek package. With a built-in flashlight and high charging capacity, the Aibocn Power Bank 10,000 mAh makes the perfect choice for people who need power on a budget. 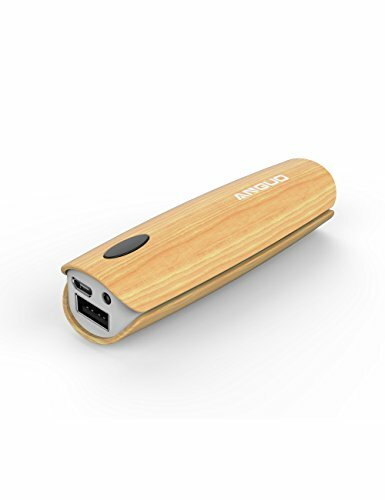 With an affordable, unique design that can fit comfortably in your pocket, the Anguo Mini Power Bank is a great choice for people on the go and on a budget. While it isn't as powerful as other power banks, it still packs enough of a punch to get you through your day without having to worry about losing your charge. It also features a convenient built-in flashlight. If you're looking for a power bank that can charge your laptops and all your other mobiles devices at the same time, look no further than the MAXOAK 50,000 mAh Portable Charger. This power bank is powerful and versatile, offering six different charging ports for all your devices, including your laptop. And with 50,000 mAh of charging capacity, you won't have to owrry about drained batteries ever again. If you're looking for a power bank to charge your USB-C Apple MacBook, consider the RAVPower 20100. This power bank includes a USB-C charging port, which is currently rare to find in power banks. This allows you to charge any of your USB-C devices, including the Nintendo Switch. It packs a hefty charging capacity and an addition two charging ports for maximum charging efficiency. Hikers and outdoors enthusiasts, this is the power bank for you. The Poweradd Apollo 2 is solar powered, waterproof and drop resistant, making it the perfect choice for outdoors use. You can charge up to two devices simultaneously on this power bank for several full charges. The unit also features a flashlight and cigarette lighter for added convenience. This power bank is made for travel, featuring built-in charging cables, FAA compliance and an ultra-compact design. The built-in cables can be used for Apple and Android devices, but there's also an extra USB port for more charging capacity. 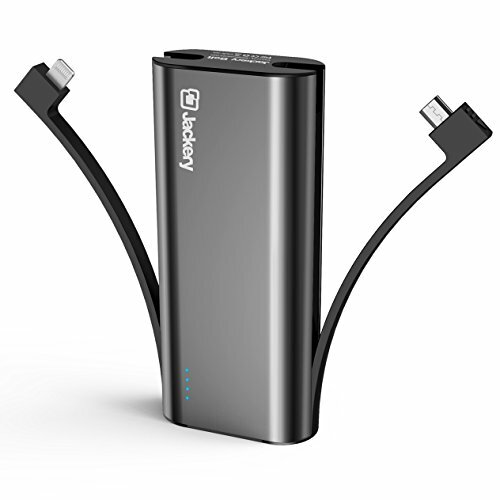 The Jackery Bolt is a great travel companion and has a high charging capacity for such a small package. The first point you should consider when buying a power bank is how much charging capacity it offers. This capacity is measured in milliamp Hours (mAh). The higher the mAh, the more charges your power bank can deliver to your mobile devices. Power banks with a higher charging capacity also typically have longer lifespans. Charging capacity can also refer to how many devices your power bank can charge at the same time. Premium power banks often allow you to charge up to three devices simultaneously. You’re likely going to be carrying your power bank with you while you’re going to work, running errands or having adventures. The durability of the power bank you purchase should also be an important consideration. The durability you need depends on your lifestyle, and there are plenty of extra-durable and rugged options on the market. However, the power bank you buy—regardless of your lifestyle—should still be able to withstand random bumps and drops. Most power banks are made with portability in mind, but the level of portability you need can vary. Ask yourself how portable you want your power bank to be. Are you going to be carrying it in your pocket or storing it in your backpack? Remember that the smaller a power bank is, the more likely it is to not have a high charging capacity. The core function of power banks is to simply charge your mobile devices, but that doesn’t mean that they don’t also offer advanced features that provide extra functionality. Depending on your own needs, you may find use for advanced and extra features like built-in flashlights or high-speed charging. For under $20, you can purchase a budget power bank. These power banks typically offer small charging capacities, often under 10,000 mAh, which means you may not be able to get a full charge with them. 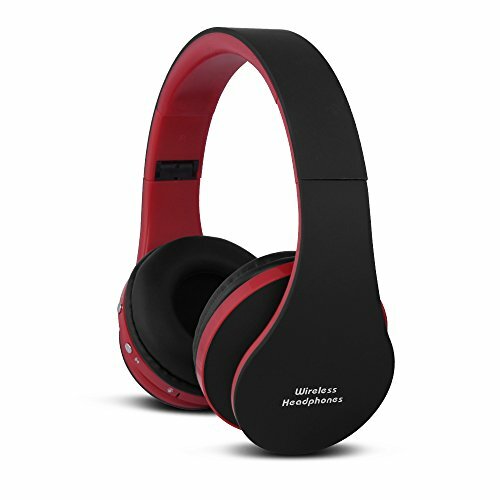 Their small size makes them ultra-portable and work just fine in a pinch. In the $20-$100 range, you can get a power bank that works for most people. These power banks offer charging capacities from 10,000 to 20,000 mAh and sometimes even include extra features. Power banks that allow you to charge multiple devices at once during multiple times of the day, you’ll likely pay over $100. These power banks have high charging capacities upwards of 50,000 mAh and can even charge laptops. They’re typically better made and more durable, as well. The Anker PowerCore Speed 10000 QC is a high-performance power bank that’s small, fast and safe to use. Even though it only offers a single output USB port, this power bank makes up for it with a comprehensive safety system and unique temperature control system. 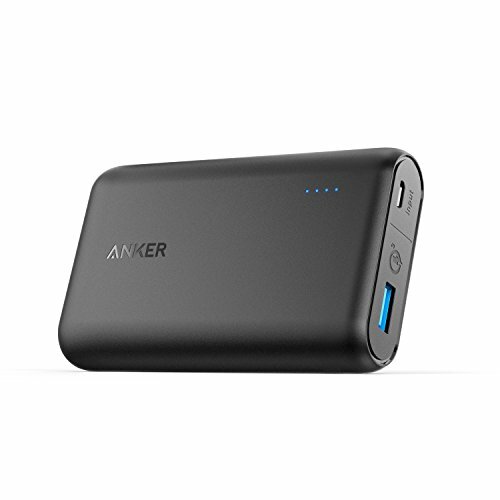 With these features and power, the Anker PowerCore is an easy choice for our top pick. If you’re looking for something small, powerful and reliable, look no further than here. Powerful and compact. Batteries with more a higher charging capacity are larger, but the Anker PowerCore Speed 10000 QC maintains a compact design. It measures in at only 4 inches long, 2.5 inches wide and less than inch thick, all while providing an impressive 10,000 mAh charging capacity. Most users report that they can charge their smartphones up to three times before having to recharge the power bank. Users also report that the Anker PowerCore is capable of delivering a full single charge to larger devices like tablets. Fast charging that actually works. Getting a quick charge is well within the capabilities of this power bank, which is refreshing in a world where fast charging seems hard to come by. 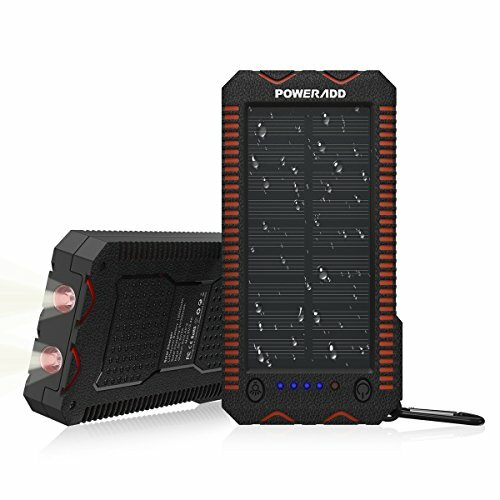 The manufacturer states that the PowerCore Speed 10000 QC can charge up to 80% of your phone within 15 minutes, and user reviews confirm the statement. In fact, most users were surprised at how fast their devices charge when using this power bank. Built with safety in mind. Fast charging batteries are suspect to overheating and exploding, which is why the Anker PowerCore Speed 10000 QC was built with a comprehensive safety system called MultiProtect. This feature boasts 11 points of safety checks, and users are pleased to find how reliable this device is when it comes to safety. Stays cool, even in the heat of the moment. The Anker PowerCore Speed 10000 QC combats overheating with a simple, yet effective cooling system. Many users were surprised at how cool the unit stayed, even while using it continuously throughout the day. Only one USB output port. If you want to charge multiple devices at once, you’re out of luck with the Anker PowerCore Speed 10000 QC. It only provides one USB output port for charging. The Lumina 10,000 mAh Ultra Compact power bank is small, durable and fast. It’s capable of charging two devices at once, even if they’re both tablets. This power bank also features a fast-charging system and a rugged design for added impact protection. The unit is also fairly small and compact for a power bank that can deliver a high charging capacity, making it more portable and powerful than many other options. Powerful charging capacity in a small package. The Lumina 10,000 mAh Ultra Compact power bank is small and powerful, measuring in at 5.5 inches long and 2.5 inches with a charging capacity of 10,000 mAh. Like other power banks with a 10,000 mAh charging capacity, many users report that they are able to charge their mobile devices several times before having to recharge the power bank. Fast charging. This power bank is equipped with a fast-charging feature that aims to recharge devices in as little time as possible. In fact, many users were pleasantly surprised at how fast their devices were charged with the Lumina power bank, even when those devices had little to no charge left. Dual charging ports. You can charge two devices at once with the Lumina 10,000 mAh Ultra Compact power bank due to the dual USB charging ports it has available. Users love the convenience of being able to charge their devices simultaneously, especially when out with other people. Extra durable. The Lumina’s casing is built from a polycarbonate material that is supposed to be extra-resistant to drops and bumps. The users who have dropped their unit have been pleased with how well it’s held up, even when dropping it onto hard surfaces. No included charging cables. This power bank includes a charging cable for itself, but doesn’t come with any cables for your own devices. You’ll either have to buy new cables or use the ones you have at home. The Aibocn Power Bank 10,000 mAh is the perfect choice for people on a budget. It offers a surprisingly high charging capacity for the price you pay, and its sleek design looks good while you’re using it. The unit also features a built-in flashlight and LED charge indicators for added convenience. 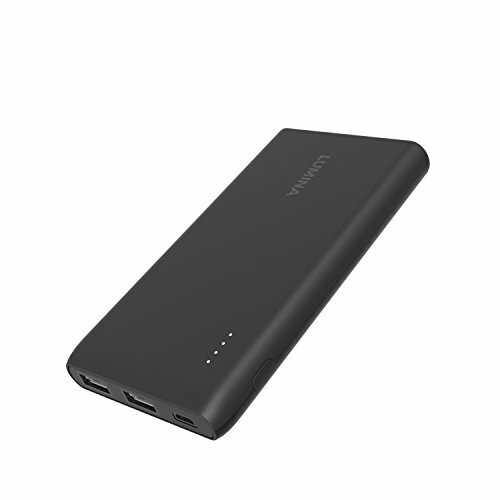 These features, among others, make this device an easy choice for our Best Value power bank. Power on a budget. At less than $15, you may think the Aibocn Power Bank 10,000 mAh would offer a small charging capacity, but as you can tell from the name of the unit, it offers a surprisingly high 10,000 mAh charging capacity. As users have used the unit, they’ve reported being able to charge a single device up to 5 times on a single power bank charge. Dual charging output. This power bank offers dual USB ports so you can charge your devices simultaneously. One port has a 1.0A output while the other outputs 2.1A for devices with larger batteries. Dual ports give you more flexibility when you have multiple devices with you or your out with friends and family. Included flashlight and LED charge indicators. The Aibocn Power Bank 10,000 mAh includes a built-in flashlight that you can use as long as the unit carries a charge. Users report that this feature came in handy during power outages and while camping. The unit also features an easy-to-see LED indicator bar that shows you how much charge remains in the power bank. No power adapter included. 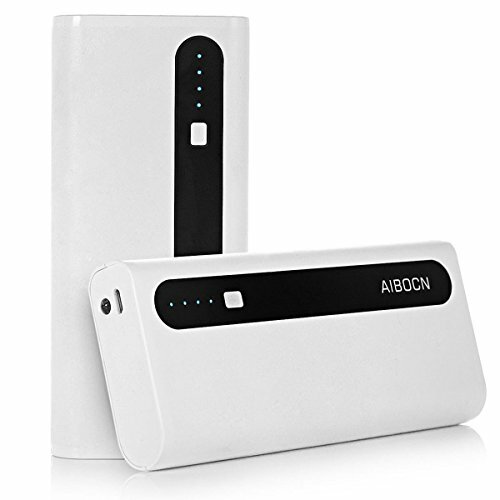 The Aibocn power bank includes a single micro-USB cable that you can use to charge the unit itself, but it doesn’t come with the power adapter to plug it into the wall. The Anguo Mini Power Bank is the smallest power bank on our list and still packs a punch, even for its small size. This device is ideal for consumers on a budget and on the hunt for something they can fit in their pocket without sacrificing too much charging capacity. It also features convenient features such as illuminated ports, a built-in flashlight and an interesting wood grain design. Incredibly compact. The Anguo Mini Power Bank is small, compact and extra portable. It’s only 4 inches long, 1.2 inches wide and less than an inch thick. Users report that they can easily pack this power bank along in their pockets without having to worry about it being an annoyance. This makes the unit an ideal solution for people with plenty of things to carry already, like parents or students. Still packs a punch. Even though this power bank is so small, it still provides a pretty good charging capacity at 3,000 mAh. While this isn’t enough to simultaneously charge multiple devices throughout the day, it’s plenty to keep your devices going until you can get to a wall charger. Most users report that this power bank is able to charge the majority of your battery before the power bank is depleted. Conveniently illuminated ports and buttons. If you’re using this power bank in the dark, you’ll be pleased to know that all of its ports and buttons are illuminated, using the unit’s internal power. This added convenience is extra useful during power outages or at night so you’re not fumbling around with your phone and charging cable, trying to get everything connected right. Built-in flashlight. The Anguo Mini Power Bank also features a built-in flashlight. This is another convenient feature that has many practical applications. According to their reviews, many users are happy to take this power bank with them on camping and road trips, and many have used it during natural disasters because of its flashlight. Doesn’t offer pass-through charging. You can’t charge the power bank and also charge another device using the power bank at the same time. The typical power bank is equipped to charge mobile devices like smartphones and tablets several times on a single charge. However, charging a laptop with a power bank needs more power than that. 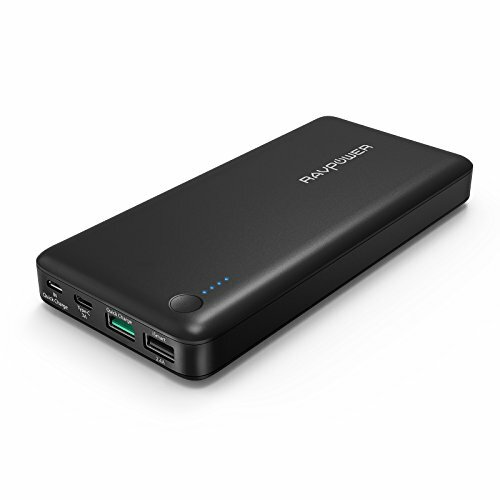 Power banks for laptops are more powerful and, as a result, larger than the average power banks. They also typically offer multiple output ports so you can charge more than one device at a time. These power banks are perfect for people on the go with their laptops and other mobile devices. The MAXOAK 50,000 mAh Portable Charger is the most powerful power bank on our list. This unit offers an incredibly high level of charging capacity along with greater flexibility than most other power banks on the market. Because of its high charging capacity, this power bank is perfect for power users who also want to charge their laptops alongside their other devices. The MAXOAK also boasts a streamlined design that is both sturdy and surprisingly compact when compared to its charging capacity. Incredibly powerful. The MAXOAK Portable Charger has an incredible charging capacity of 50,000 mAh. This makes it one of the most powerful power banks on the market today. Users report that it can charge their laptops completely on a single charge. Consumer reports also indicate that this power bank can charge multiple phones several times on a single charge. Features an impressive number of output ports. With four USB ports and two other ports for laptops and digital cameras, you can charge up to an impressive six devices at the same time without worrying about overheating or overcharging. Includes a huge variety of charging adapters. The MAXOAK 50,000 mAh Portable Charger includes 14 different kind of charging adapters that you can use for a variety of different laptop brands ranging from Lenovo to HP. While these adapters don’t cover every brand of laptop, most users were happy to find that the most commonly used laptops are supported. Sleek and compact design. For such a large charging capacity, this power bank actually sports a surprisingly small and light design. Many users report that they were surprised at how portable and compact the MAXOAK Portable Charger, weighing in a little under three pounds and measuring in at 5 inches wide, 8 inches long, and 1.3 inches thick. This makes the power bank easy to carry around for family trips during which everyone always seems to lose power. Doesn’t work for MacBooks. 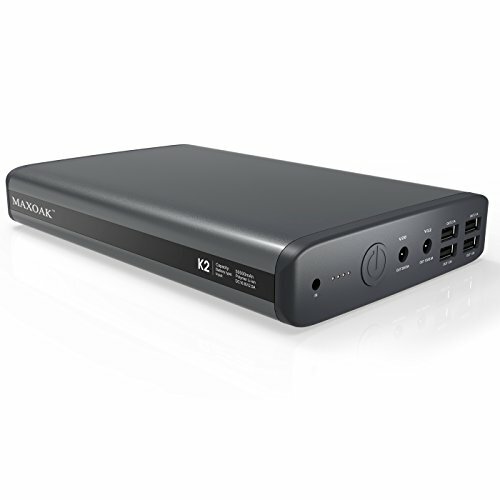 The MAXOAK 50,000 mAh doesn’t support with Apple MacBooks, although it does still support iPhones and iPads. The RAVPower 20100 power bank is a powerful and capable power bank that is capable of charging up to three separate devices simultaneously. With fast charging technology, this power bank can charge your devices faster than other units on the market and the device itself also charges faster. The RAVPower 20100 is the perfect product for people looking to charge their Apple MacBooks and other mobile devices with reliability. Can charge USB-C devices. One of the biggest selling features for the RAVPower 20100 is its available USB-C output. This is especially helpful if you have a newer Apple MacBook and want to be able to charge it on the go. There are a variety of other newer devices, such as the Nintendo Switch, that also use USB-C for charging purposes. You can charge all of those devices using this power bank. Powerful charging capacity. The RAVPower 20100 power bank has an impressive charging capacity of 20,100 mAh. This level of charging capacity tends to be sufficient enough for most consumers. Most users report being able to charge their devices several times with the RAVPower 20100 before having to recharge the power bank. Users also report being able to get a full charge on their MacBook. Includes fast charging capabilities. One of the USB ports on the RAVPower 20100 is capable of quick charging, which charges your devices faster than a regular wall charger. Most users are happy to report that they are able to charge their devices that support quick charging up to 80% in just a half an hour. The unit itself takes longer to charge. Many users are happy that the power bank can charge their devices quickly, but are disappointed that the unit itself takes a long time to charge to full capacity. In today’s world of constant connectivity, it has become more important to have mobile devices charged at all times, even when there are no power sources available. These units are charged via solar panels built directly onto the power bank. Many of these power banks are also weatherproof and sturdier than standard power banks. These features make solar power banks perfect for outdoors enthusiasts or people who are always on the go in places lacking traditional power sources. The Poweradd Apollo 2 is a power bank that can be charged via solar power using the built-in solar panels or from conventional power sources. The Poweradd Apollo 2 also features two USB charging ports so you can charge devices simultaneously with its powerful charging capacity. This capable power bank is rugged, waterproof and also includes a built-in flashlight, making it the perfect device to take on hiking and camping trips. Solar powered charging. The Poweradd Apollo 2 is a solar power bank, which means it can be charged simply by exposing its integrated solar panels to the sun. It can also be charged through conventional power supplies if it’s night. Solar power banks are especially useful for outdoors enthusiasts or in the case of emergencies when there is no power. Powerful charging capacity. This power bank offers a 12,000 mAh charging capacity, which is more than the average device on the market, while still maintaining a compact size. Many users report that it can charge their smartphones two to three times before needing to recharge. Built to withstand water and drops. The Poweradd Apollo 2 is made from IPX7 water and dustproof materials. This means that you can leave it out in the rain or hike in a dusty area without worrying about the power bank being affected. It’s also built to be resistant to damage from drops, which makes it sturdier than most power banks on the market. Many users report that they’ve dropped the device in water and on hard surfaces and it still works perfectly. Includes extra features for added convenience. For added convenience, this power bank includes a couple of extra features. It has a built-in, dual-LED flashlight that can be used in three different modes: SOS, strobe and steady. The unit also features a built-in cigarette lighter and comes with a hook for hanging it on your backpack. No fast charging. The Poweradd Apollo 2 doesn’t feature fast charging functionality, meaning your devices will charge as fast as they do on a normal wall outlet. While most power banks are designed for portability and mobility, power banks for travel are typically thinner, lighter and offer more power relative to their smaller sizes. These units are also sturdier than most power banks, designed to endure the inevitable bumps and scuffs that come along with traveling and often include built-in charging cables so you don’t have to worry about keeping track of one more thing while you’re on the road. The Jackery Bolt 6,000 mAh is a power bank made specifically for mobility. It boasts an ultra-compact design with built-in charging cables that store neatly inside the device’s body. You can also charge the unit itself while charging your devices, making it even more convenient. With these features, an impressive charging capacity for its size and fast-charging capability, this power bank makes the perfect fit for people who are always traveling or on the move. Ultra-compact. The Jackery Bolt 6,000 mAh measures in at 4 inches long, 2 inches wide and less than an inch thick, making it one of the smaller power banks on the market. This ultra-compact design is perfect for carrying in your pocket or bag while you’re out and about. Users are also happy with how light the unit is, weighing in at only 8 ounces. Impressive charging capacity. With 6,000 mAh of charging capacity, you can expect to charge your devices several times before needing to recharge the power bank. Many users report being able to charge their larger devices fully on a single charge and their smaller devices three or four times fully on a single charge. Includes built-in charging cables. Perhaps the most convenient features of this power bank are the built-in Lightning and micro-USB cables for both Apple and Android devices. These cables simply pull off the side of the unit and are stored by pushing them back in. The cables themselves are also durable and sturdy. Users are especially happy with this feature since it means they don’t have to worry about the mess of carrying about extra charging cables. The unit also features an extra USB output port, meaning you can charge up to three devices at a time. FAA approved. If you use air travel, you have to follow a strict set of rules when it comes to batteries. Fortunately, the Jackery Bolt is FAA compliant, meaning you can take it with you on airplanes in your carry-on luggage. While you can’t use it on the plane, many users are still happy that they have something available to them immediately once they land. Short connecter tips. Some users mention that the actual charging connectors for the Lighting and micro-USB cables are shorter than normal, meaning they either had to adjust or take off their phone cases to use the power bank.